When the Nelsons pull into the shop, a cheerful spirit arrives with them. They seem genuinely happy to be here, and we love their attitude about car maintenance and repair. Josh and Laura are both quite brilliant people. They met while attending UCF where they graduated in 2012 and were married November 22, 2013. Both engineers – Josh, manufacturing, and Laura, civil – they are particularly strategic in everything they do. Meticulous about their finances and maintaining their vehicles, they’ve really built a great foundation for a long, happy marriage. The hatchback on his 2004 Acura RSX is a huge plus for Josh. Being a thrifty guy, he, of course, also likes the gas mileage he gets during his lengthy commute to and from work. Laura likes how smooth her 2010 Toyota Corolla drives and how comfortable it is. While she has a short commute to work, it’s also their car of choice for the weekends when they might head out to play in the great outdoors on an occasional camping or kayaking trip. Sometimes they’ll zip over to Florida’s Space Coast to visit family or take a longer road trip up to North Carolina or Virginia. When it comes to concerns, Laura gets nervous about how her daily driving habits might put wear and tear on her car, especially when it comes to their neighborhood’s many speed bumps. Since Josh’s concerns are in the monetary realm, he is looking at his bank account, especially when it comes to pricey repairs such as in the engine or transmission. In fact, Josh tells me that before coming to Marinelli Auto Service, spending any money on his car required a lot of time looking through coupons and calling around to find the best bargain. “Bargain” may well be Josh’s middle name. He’s vigilant about looking for discounts and spends his Sunday mornings clipping deals for his coupon binder – a gift from Laura. Laura laughs lovingly as she tells me about how much free toothpaste they have stocked away that Josh got from a drugstore chain. 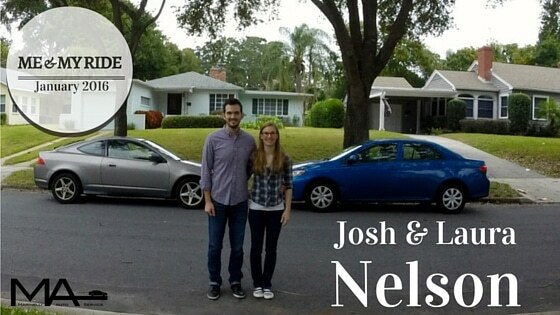 “I almost always won’t buy anything unless I have a coupon or a savings code,” Josh shares. In fact, he’s been known to sort through coupons while waiting for an oil change in our office. “I’ve told Andrew before, I like to make sure I’m getting a pretty good deal. Previously, I would never go to a place to get my car fixed and not have a coupon and not negotiate. So, I’d have my coupon for a $17.99 oil change and if they called me and said, ‘You need this repair that costs $500,’ I would call all these other places and find out how much they’d charge and then I would negotiate for the best deal. “We get a fair price from the get-go,” Laura adds. “I believe that he’s running a business that I want to be part of,” says Josh. The cheerful spirit the Nelsons bring with them is not one they’re used to when dealing with their vehicles’ maintenance and repairs. It surely brightens up the place, and Andrew and I really enjoy having them here – only we hope it’s mostly for the occasional maintenance item so they can spend the rest of their time having fun weekend adventures.